The Danville Science Center, an affiliate of the Science Museum of Virginia, will open a new theater will allows guests to fully explore the known universe as well as some fascinating phenomena right here on Earth. "We are truly excited that the Danville region will now have their own place that will serve as a launching point for kids to change the world," said Richard C. Conti, Director, Science Museum of Virginia. Danville Science Center will open the brand new Digital Dome Theater February 22. The new theater will allow guests to fully explore the known universe as well as some fascinating phenomena right here on Earth. This immersive theater will showcase the scientific wonder of space and engage visitors with live astronomers. The new theater is a 40 foot hemispherical dome and will seat 100 guests. Equipped with a Definity 4K digital projection system and brilliant sound quality, the new theater experience will be five times the definition of your HD television at home. 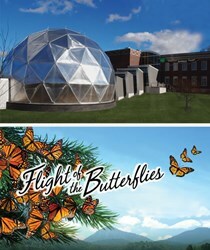 In addition to astronomy presentations, the dome theater will offer large format films starting with Flight of the Butterflies. Adventurers of all ages can migrate with millions of Monarch butterflies across North America and experience the thrill of scientific discovery. The $3.4 million project is a collaboration among the Commonwealth of Virginia, the City of Danville, the Danville Regional Foundation, and the J.T. Minnie Maude Charitable Trust and many other foundation and individual investors throughout the life of the project.